It’s a commonly accepted, scientifically proven fact that Twitter is bad for you. Not only is it awash in a synapse-frying torrent of mental spew and unpleasant headlines, but the network is also a performative minefield waiting to destroy either your career or your emotional well-being — and quite often both if given enough time. However, some of us use Twitter for our jobs. And sometimes we still find Twitter occasionally enjoyable, like when we all get to watch a rocket launch together. If you’re on Twitter period, it’s a good idea to take precautions around your tweet history. We live in an era when alt-right trolls and political operatives will spend hours scanning the online footprint of a smear campaign target, all with the purpose of dredging up past jokes and verbal faux pas to twist into context-less, career-costing hit jobs. The most recent example of this was Guardians of the Galaxy director James Gunn, who was targeted by prominent alt-right members for decade-old offensive joke tweets he had not only since apologized for, but had written while not employed by Disney. Nonetheless, the company let Gunn go as director of the third Guardians movie, and the alt-right has since moved on to targeting other anti-Trump comedians and Hollywood figures. This stuff happens all the time nowadays; the rulebook was codified during Gamergate and has since spread throughout the greater online culture war. Few people are professionally, financially, or mentally equipped to weather such a storm. Meanwhile, large corporations tend to be run by online illiterates who care only about looking like they’re doing the right thing. So if you can’t, or simply won’t, cut Twitter out of your life, the best protection you can provide yourself is the automatic deletion of your Twitter history. Here’s where to start if you’re interested in nuking your timeline and keeping future tweets from falling into the internet’s vindictive void of posterity. If you’re looking for something more robust, you can use a paid service like TweetDeleter or TweetEraser. 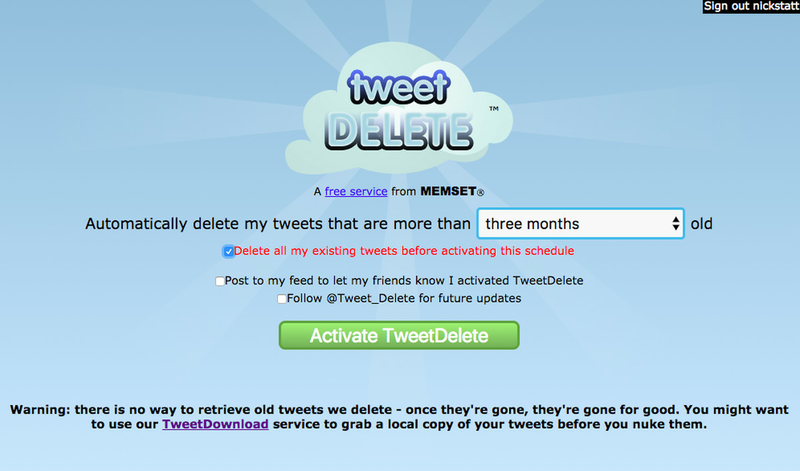 TweetDeleter costs $5.99 a month and lets you delete up to 3,000 tweets per day, on top of letting you auto-delete tweets of a certain age. The service also has an unlimited option for $8.99 a month that lets you wipe your entire history clean at once and also lets you upload your archive. TweetEraser is similar, costing $6.99 for 30 days of access and granting users twitter archive importing, multiple account support, and ad-free use. TweetEraser is a bit more affordable, and it doesn’t charge you on a recurring basis with the understanding that you’d use the service likely once to wipe your history. But it doesn’t appear to let users set up automatic deletion, so you’d need to continue paying for the service, like with TweetDeleter, if you’d like to continuously wipe your tweet history at regular intervals. Both paid services are nicely designed and offer perks, but you by no means have to pay money to perform this task, and TweetDelete works fine for most people. 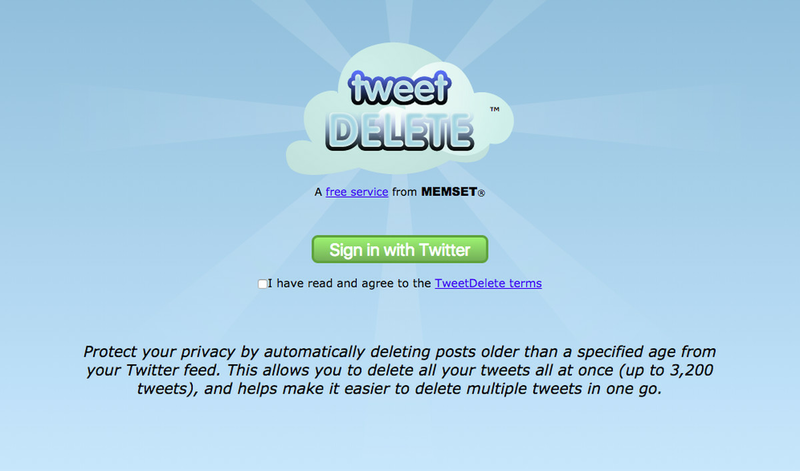 Before you settle on a service to wipe your Twitter history, you might want to consider archiving your tweets. If you end up deciding to pay for a service like TweetDeleter or TweetEraser, you can upload that archive to store it securely. You can also just hold onto the folder, in the event you ever want to casually scroll back to that three-month period when you first signed up for Twitter and all you could think to tweet about was breakfast and the weather and earnest hashtag use. To access your archive, head over to Twitter Settings, click on the “Your Twitter Data” tab on the left-hand column, and scroll down to “Twitter Archive.” From there, you can request your archive be sent to the email address associated with your Twitter account. Depending on how many pointless tweets you’ve fired off into the ether over the years, that may take a long time. Eventually, you’ll get an email from Twitter asking you to download your archive. It will arrive in a .zip file, which contains a folder within which you’ll find an index.html file. Clicking that will open an easy-to-read webpage in your browser window for scrolling through your entire Twitter history, so be careful with that particular file lest it fall into an enemy’s hands. You can, of course, choose to say sayonara to all those well-crafted and timely opinions by destroying all traces of your Twitter presence without a backup. This is, in my humble opinion, the path of least resistance and the surest way to avoid self-destruction. But to each their own. Because TweetDelete is the most popular and user-friendly of the free services — and the one I used recently — we’ll focus on how to use that one. The first hurdle that must be acknowledged is that Twitter’s application programming interface, which is the software toolkit that allows developers to access your Twitter account and tinker with it, only allows the mass deletion of up to 3,200 tweets for reasons I cannot explain. That makes it a little tricky if you’re trying to mass-delete your history without using a paid service like TweetEraser that automates some of the annoying aspects of the process. Still, it’s doable with a little time and effort. With TweetDelete, you simply need to sign in and start initiating the deleting process a distinct number of times equal to your total tweet count divided by 3,200. For instance, if you’ve tweeted 15,000 times, you’ll need to use TweetDelete five times in a row. Luckily, it is not a complicated process. You sign in with your Twitter account, authorize the app, and then check the box that reads, “Delete all my existing tweets before activating this schedule.” Then you click activate. Forget about setting an auto-delete schedule at first, as you’ll need to keep activating TweetDelete until it’s wiped your entire account. Before you do so, be sure to uncheck the “post to my feed” and “follow @Tweet_Delete” boxes, as those two automated actions are the only spammy aspects of the service you’d likely want to avoid. It’s important to note that the process takes time, so you’ll see your Twitter history slowly disappear over the course of minutes every time you activate TweetDelete. You can check the progress by hitting refresh on your profile page. In the event you’ve only tweeted less than 3,200 times, or you’ve now set into motion the blissful obliteration of your Twitter history, you need to settle on an automatic delete schedule. That can be done either on the last cycle of deletion or anytime in the future, as TweetDelete lets you override any previous schedule with your most recent selection. The service lets you choose between one week, two weeks, one month, two months, three months, six months, or one year. I personally chose three months, but depending on how often you tweet regretful opinions or fear a vengeful alt-right troll is stalking your timeline waiting to pounce, you may want a quicker turnaround. But that about sums the whole process up. You can always sign back into TweetDelete if you want to speed up the auto-delete schedule or extend it. You can also sign in just to activate the service and wipe clean your past few months, in the event you just want to start fresh again and don’t feel like waiting for the timer to reset. The next, and final, step on the list here is to breathe deep, because you’ve now put into a place a nice little safeguard against the malicious users out there who often make Twitter such an unpleasant place to be. Thankfully, with some diligence and a clear head and one less whiskey mixed drink, you’ll never tweet a bad thing ever again. Of course, we all know that’s impossible, but recognizing that ultimate truth is what participating in Twitter is all about. Good luck and happy tweeting.